The Integral CompactFlash Card Reader is a fast and convenient way of transferring data between any CF Card format and your PC or Mac. Insert your CompactFlash Card into a connected reader and view your files instantly. Integral USB 2.0 microSD Card Reader. FAST UK Dispatch. Multi SDHC SDXC microSDHC MS M2 CF external flash card reader USB 3.0. Form Factor: Reader. USB Flash Drives. Connection: USB 3.0. Included Units: one. Will call available in Santa Clara CA. Santa Clara, CA 95054 US. Manufacturer Part Number: LRW307URBNA. The Lexar Professional USB 3.0 Dual-Slot Reader is a professional-level, portable USB reader that provides maximum high-speed file transfer, with a blazing-fast USB interface speed up to 500MB/s. SuperSpeed USB (USB 3.1 Gen 1). INTERFACE SuperSpeed USB （USB 3.1 Gen 1）. USB bus powered. Features and Specifications. 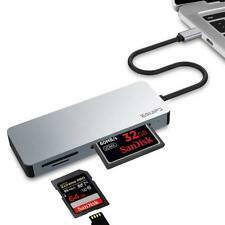 You are purchasing a SanDisk ImageMate 12-in-1 USB 2.0 Card Reader / Writer. NEW SEALED. Hot swappable between all cards. Allows connection of 3 devices through high speed USB 2.0 ports. Powered for printers, external hard drives and other heavy power peripherals. Credit Card. No foreign money orders. GS-RFID-USB GDS3710 RFID USB Card Reader. Available for use with the GDS3710 IP Video Door Station. Grandstream Door System USB RFID Card Reader for reading key cards. Hoodman builds RAW STEEL ruggedness and “Pin Guardtm” into a new SuperSpeed USB 3.0 UDMA Card Reader. The SD slot is designed with a second row of connectors that dramatically improves speed and performance, while also allowing for backwards compatibility with non-UHS-II cards. Simply plug the reader into a USB port on your computer and gain instant access to your files. Designed to fit 3.5" PC bay, contains two front fascia panels, choose mat black or classic white. Two LED-s indicate power on, card in and data transfer. Internal USB motherboard header. USB 2.0 (1.1/1.0 compatible). 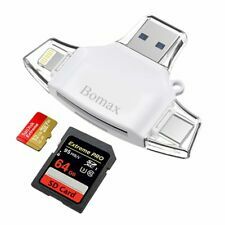 TF card reader and SD card reader 4 in 1 SD card reader, small and easy to carry, design for USB C/Type C/Lightning/Micro USB/USB connector. (Android phone must open OTG function). 4 in 1 Card Reader which is suitable for all your devices,,Lightning connector for iOS devices-iphone & ipad, Micro USB connector for Android Phone devices,TYPE-C connector for USB C devices like as Samsung Galaxy S8 S8 New Macbook Pixel XL Nexus 5X 6P LG G5 G6 V20 Pixel 2 XL and other usb-c device. Supports USB-C Male, USB 3.0 Female, SD/MMC card, Micro SD card and USB-C Female interface. The USB 3.0 port allows you to connect a USB device or another hub to the host USB-C computer. 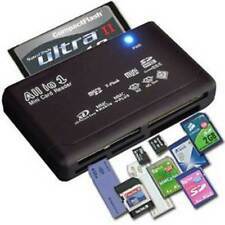 Supports SD/ SDHC/SDXC (up to 128 GB). SD, SDHC, SDXC. The Integral USB 2.0 Single Slot SD / SDHC Card Reader is a fast and convenient way of transferring data between any SD or SDHC Card and your PC or Mac. Compatible with the latest technology – SDHC (SD High Capacity). Supports high speed USB 2.0. Interface USB 2.0. With Black and Silver face plate. OutletPC was founded in 2001 and since then we've been focused on getting people around the world great deals on computer products, systems, and hardware. The reader is also compatible with standard CF and SD cards and USB 2.0. X , Linux v.2.6. MicroSD / SDHC. Compact Flash CF. Secure Digital SD. Travel Tripods. Tablet & Ipad Cases. USB Flash Drive. USB Cables & Hubs. All-in-1 Card Reader/Writer. Specs Card. MAC & PC System Compatibility. High speed USB. Rapid data transfer. Manufacturer Part no. The Lexar Professional Workflow-UR2 3-Slot UHS-II Micro-SD Reader is designed for use with the Lexar Workflow Hubs or can be used independently. Can be used with the optional Lexar Workflow USB Hub or on its own via the supplied USB 3.0 cable. The Lexar Multi-Card 25-in-1 USB 3.0 Reader is an easy-to-use, all-in-one file transfer solution. The Lexar Multi-Card 25-in-1 USB 3.0 Reader leverages SuperSpeed USB 3.0 technology to provide high-speed transfer with a USB interface speed up to 500MB/s. 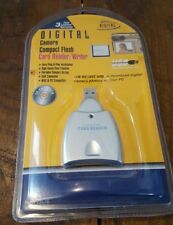 USB FLASH MEMORY CARD READER Media CF, SD, XD, MS, New! Product features/functionality are identical. 1 x USB All-In-One card reader Combo. Plug & play compatible with any USB 1.1 and 2.0 port in PC running Windows 7, Vista, XP, 2000, NT and 98SE and Mac running Mac OS 9.2.2 and 10.2.3. All-in-One Card Reader and Connecting USB Cable. FREE in USA. 3 Years Manufacturer Warranty. Compatible PC & MAC. Excellent Interface. This CFast reader accepts all CFast cards (. LEXAR WORKFLOW CR1 CFast 2.0 USB Reader. Other readers in the Workflow range include XQD, MicroSD, CFast, Compact Flash as well as USB hubs and SSD Storage modules. ). And transfer them to my Amiga via a PCMCIA slot Compact Flash adaptor. This versatile reader lets you easily transfer photos, videos, music and other data between your favourite cards and your PC. limited USB 3.0 ports. For peace of mind, it's covered by a two-year warranty, free technical support and legendary Kingston reliability. 50-in 1 Card Reader-Writer. Compatible PC & MAC. Excellent Interface. 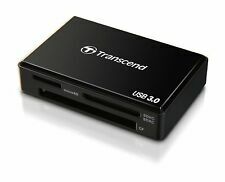 This USB 3.0 internal multi-card reader supports UHS-II to greatly enhance your file transfer rates. It also enables concurrent downloads. Fast speed and wide compatibility make this multi-card reader an ideal solution for photo kiosks or photo labs, and desktop computers. SANDISK ImageMate SDDR-92-A15 USB 2.0 Compact Flash I/II Card Reader Writer NIB! Condition is New. This unit reads and writes CompactFlash (CF) cards, Types I and II. Saves batteries: let the ImageMate USB 2.0 reader/writer (not your portable device) transfer your files. Happy Hunting! Kingston Technology is the world’s independent memory leader and is well-known for providing high quality memory products at an attractive price. System Specific memory modules are designed and tested in the relevant systems prior to release; and they are guaranteed to be 100% compatible with your system. All Kingston System Specific memory come with a lifetime warranty. Kingston Technology's MobileLite G4, USB3.0, Multi-Card Reader, Black Grey Color. 7in1 USB C Hub Tipo C Adaptador USB 3.0 SD TF Lector de tarjetas 4K HDMI Para MacBook Pro y otros dispositivos TIPO C. 1 X lector de tarjetas SD. 7in1 USB C Hub Type C Adapter USB 3.0 SD TF Card Reader 4K HDMI For MacBook Pro and other TYPE C devices. What is pictured is the lot you will be receiving. This is being sold as is. FREE in USA. MAC 10.4.6 or greater. MICROSOFT XP and Window 7 & 8. MAC & PC System Compatibility.